The two Aroon indicators are the Aroon-Up and Aroon-Down, sometimes referred to as the bullish Aroon and bearish Aroon. The Aroon-Up indicator reflects the number of days since the most recent 25-day high. The Aroon-Down indicator shows the number of days since the most recent 25-day low. The Aroon indicators take rather an inverse stance as compared to the usual momentum oscillatorsMACD Oscillator - Technical AnalysisThe MACD Oscillator is used to examine short-term moving average convergence and divergence. 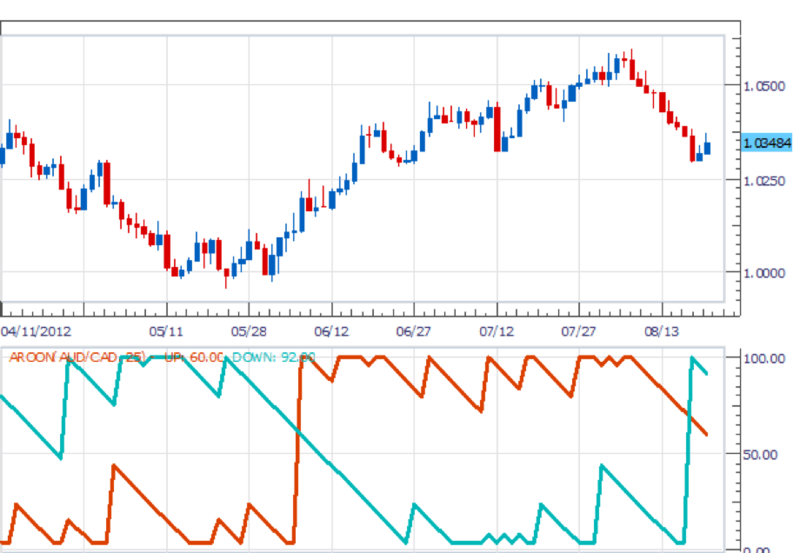 The MACD Oscillator is a double-edged technical indicator in that it offers traders and analysts the ability to follow trends in the market, as well as gauge the momentum of price changes., as the Aroon focus is more on time relative to price rather than price relative to time. The Aroon Indicators are plotted in a separate window from the main chart windowHow to Read Stock ChartsIf you’re going to actively trade stocks as a stock market investor, then you need to know how to read stock charts. Even traders who primarily use fundamental analysis to select stocks to invest in still often use technical analysis of stock price movement to determine specific buy and sell, stock charting that shows price action and are figured in percentage terms, with values ranging from 0 to 100. The results of both calculations are then multiplied by 100 to yield a percentage number. The two Aroon indicators are basically tracking, respectively, when the most recent highs and lows occurred. Higher values for the Aroon indicators reflect a more recently occurring high or low, and lower Aroon values reflect a more distantly occurring high or low. Higher Aroon values indicate a stronger trend, with lower values indicating a weaker trend or the absence of trend. Cautionary Note: A glance at the far right-hand side of the chart shows that a bearish Aroon indicator crossover is rather late in signaling a trend change from bullish to bearish, not occurring until after nine down days in a row in the market, during which price had already fallen substantially. However, a traderEquity TraderAn equity trader is someone who participates in the buying and selling of company shares on the equity market. Similar to someone who would invest in the debt capital markets, an equity trader invests in the equity capital markets and exchanges their money for company stocks instead of bonds. Bank careers are high-paying might have taken the downturn of the Aroon-Up indicator as a sign of the uptrend weakening and, combined with looking at price action, decided to make a judicious exit from the market prior to the actual Aroon-Up/Aroon-Down bearish crossover. 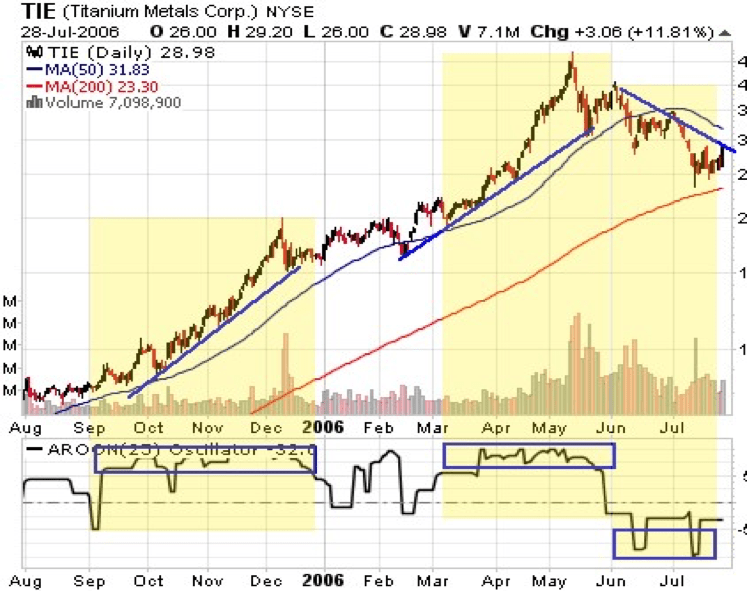 Some versions of the Aroon combine the two indicators into a single Aroon indicator that, like other oscillatorsMcClellan Oscillator - Technical AnalysisThe McClellan Oscillator is a type of momentum oscillator. The McClellan Oscillator is calculated using exponential moving averages, and is designed to indicate the strength or weakness of price movement, rather than its direction., has values ranging from -100 to +100. In the single indicator version of the Aroon, values around the middle zero line indicate the absence of a trend, a market that is ranging or in a consolidation phase prior to forming a trend. Values above +50 indicate a bullish trend and values below -50 indicate a bearish trend. The single version of the Aroon is shown in the chart below. Dark blue rectangular boxes are drawn around the Aroon indicator line to show where it reaches levels either above +50 or below -50. Note how price action, either staying above or falling below the uppermost trendline drawn in the main chart window confirms the change in the direction indicated by the Aroon indicator. Also, note the additional confirmation of a trend change that comes from the extremely high volume levels (shown at the bottom of the main chart window) that occur at the peak of the uptrend and the beginning of the sell-off. The dotted line in the middle of the Aroon indicator window is the zero line. Market analysts and traders can obtain a number of trading signals from the Aroon indicators. Trading signals can be obtained from Aroon crossovers. Crossovers of the two Aroon indicators, either the Aroon-Up indicator making a bullish crossover above the Aroon-Down indicator, r the Aroon-Down indicator making a bearish crossover to above the Aroon-Up indicator, are generally interpreted as trend change or market reversal signals. However, as with most momentum oscillator indicators, the Aroon is prone to generating false signals during volatile, choppy trading action. Therefore, traders are wise to look for confirming price and volume action rather than acting based on the Aroon indicator alone. Trading signals can also come from high Aroon values. In the two-indicator version of the Aroon, values above 70 and nearer 100 indicate a strong trend. Conversely, Aroon values of 30 or below indicate a weak trend. As already stated, in the single-indicator version of the Aroon, strong trends are indicated by values greater than +50 or -50. Paradoxically, very high Aroon values, right at or very near 100, are sometimes interpreted as early warning signals of an upcoming trend change or corrective market reversal. If the Aroon-Up value remains at or near 100, this is interpreted by some market analysts as indicating overbought conditions in a market that make a sell-off likely. If the Aroon-Down indicator stays around 100 for several time periods, this may be interpreted to represent oversold conditions in a market, thereby presaging a rally to the upside. Again, traders are advised to look for confirming signals from price or volume action. Although sustained high Aroon values do often indicate overbought or oversold conditions in a market, most experienced traders know that a market can remain in a technically overbought or oversold condition for some time, with price continuing to move significantly in the direction of the existing trend before any corrective retracement in the opposite direction begins. The two Aroon indicators are used to identify ranging or consolidating markets when the two indicator lines run parallel to each other – or in the single-indicator version of the Aroon, when values remain at or near the zero line. In such market conditions, traders typically stand aside until changes in the Aroon indicator’s movements, along with price action and/or increases in volume, clearly indicate the beginning or resumption of a trend. The Aroon indicator can be profitably used as a confirming indicator along with other technical indicators of a bullish or bearish trend, or as an indication of a possible upcoming market reversal. It can also be used as a trade filter to help traders avoid taking positions in volatile or ranging markets. Head and ShoulderHead and Shoulders Pattern – Technical AnalysisThe head and shoulders is a pattern commonly seen in trading charts. The head and shoulders pattern is a predicting chart formation that usually indicates a reversal in trend where the market makes a shift from bullish to bearish, or vice-versa.